Porters vineyard was first planted by Annabel and John Porter in 1992 with the first vintage in 1995. The vineyard is on Kitchener Street, the main road into Martinborough and is only five acres producing Pinot Noir and Pinot Gris. Yields are low with their emphasis on producing grapes of the best quality every vintage, adopting organic principles and practices wherever possible. Vine prunings are either burnt or mulched back into the soil, the pips and skins from the pressed grapes are composted and used as mulch, and sprays are kept to a minimum. The average annual production is in the region of 750 dozen which makes Porters one of the smallest producers in Martinborough, a boutique winery indeed! 2006 was a bountiful vintage. The spring provided ideal conditions for flowering and fruit set leading into a warm summer. During the autumn, the cool evenings were a great foil to the heat of the day, and provided excellent conditions to promote physiological ripeness. There was more rain than normal over the season which meant that the vines did not experience the drought stress of previous vintages. The weather over vintage was fine and clear which enabled Porters to harvest Pinot Noir and Pinot Gris grapes in superb condition. 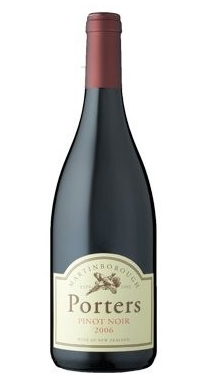 I really enjoyed this Martinborough Pinot - elegant and complex. Not heavy handed in any way. The nose is full of strawberry and cherry and the palate not only had the fruity notes but also spice and fine tannins with an excellent earthy character. Acidity was nicely balanced by the fruit and tannin. After drinking quite a few Oregon Pinot Noirs which had excessive acidity in the last few weeks, it was nice to try another great Pinot Noir from New Zealand which exhibited such excellent balance. New Zealand Pinot Noir I love you! Gibbston Valley has seven vineyards, two in the Gibbston sub-region and five in the Bendigo sub-region. A semi-continental climate with extreme diurnal rhythms, temperatures can fluctuate during the growing season between 30 degrees centigrade during the day and 5 degrees at night. Gibbston Valley wines caught my eye because the 2012 Pinot Noir won the best wine of Decanter's January 2014 review of Central Otago Pinot's. This 2006 was almost see through in the glass. The palate was complex and velvety smooth with a savoury, herby, blackberry, sweet cherry liquer and smokiness. Very forward, very fresh. Great. Bought hard to find wines £26. Mt Difficulty Estate is comprised of six vineyards in the South Island of New Zealand; Templars Hill, Pipeclay Terrace, Menzies Terrace, Mansons Farm, Target Gully and Long Gully – total plantings of 40 hectares protected by the rain shadow of Mount Difficulty in Bannockburn, Central Otago. Central Otago is comprised of four distinct sub-regions, separated by mountains and deep gorges. The Cromwell Basin accounts for 70% of the region's vineyards and includes Bannockburn in the south, Lowburn, Pisa and Bendigo to the north. A further 20% of plantings are found around Gibbston, where most vines occupy north-facing slopes and terraces above the dramatic Kawarau Gorge. In the southwest of the region are Clyde and Alexandra (7%), while the remainder (3%) are located around Wanaka, where vineyards run down to the lakeshore against a backdrop of snow-clad mountains and glaciers. Central Otago is the only area in New Zealand with a semi-continental climate - nowhere else in the country experiences greater daily and seasonal extremes of temperature. Summers are hot and dry, with autumns cool, generally dry and with cold nights. Relatively low rainfall and humidity means a low incidence of disease and rot, greatly reducing the need for spraying. The large diurnal temperature variation (the difference between daytime and night-time temperatures) during ripening contributes to flavour intensity, gives depth of colour and stability to the wines. Heavy frosts are common throughout the winter, and can also occur during spring and autumn. As a result, most vineyards are on warmer, north-facing slopes. Frost protection measures such as wind machines, water sprinklers and helicopters are also used. Visitors to the region in April and May will witness harvest time, when vineyards and wineries are busy picking, sorting and crushing the fruit for the new vintage. It all began in the early 1990's, when the owners of five newly-planted vineyards in Bannockburn shook hands and decided to work together to produce wine under one label, Mt Difficulty. The handshake bound the owners of Molyneux, Mansons Farm, Verboeket Estate and Full Circle until 2004 when Mt Difficulty Wines Ltd was formed, and the majority of the individual vineyards passed into the ownership of the company. As a result, Mt Difficulty Wines Ltd now owns some of the oldest vineyards in the Bannockburn sub-region of Central Otago. The unique microclimate of the Bannockburn area is partially created by the presence of Mount Difficulty which overlooks the southern Cromwell basin, and is the namesake of Mt Difficulty Wines. Mount Difficulty is integral in providing low rainfall and humidity for the region. Bannockburn enjoys hot summers, a large diurnal temperature variation and long cool autumns; conditions which bring the best out of the Pinot Noir grapes. The soils are a mix of clay and gravels, but all feature a high pH level. The Mt Difficulty brand started in 1998 with a very small production of Pinot Noir and Chardonnay, made by Grant Taylor of Gibbston Valley Wines (now of Valli Wines). Prior to this the Gang sold their grapes to either Gibbston Valley or Chard Farm. The Air New Zealand wine awards in 1999 put Mt Difficulty on the map. Conditions were difficult but the quality of fruit was very good, provided the right decisions were made. Spring was fantastically settled, which led to excellent flowering and fruit set. Usual spring conditions arrived late, and unsettled weather was the norm right through January and February! Despite this, it was also pretty warm; it was almost too perfect for canopy and bunch development, leading to bigger than normal berries, and higher bunch weights as a result. Finally some semblance of normality arrived in March with conditions settling. These conditions continued through autumn, other than one wet spell which highlighted how tender and thin-skinned the berries were this season. In the winery it was a season where the fruit needed empathy, and the direction of the wine was dictated by the fruit. The grapes for the wines that carry the Mt Difficulty Estate label are subject to two strict criteria: they are managed under the umbrella of the Mt Difficulty viticultural team and must be sourced from vineyards situated on the South side of the Kawarau River at Bannockburn. Each has a specific terroir, largely influenced by climate, and offers a variety of soil types from open gravels to heavier clays. They are all low in fertility, and include light sands, clays, loams and gravels. Mt Difficulty Estate Pinot Noir is blended from a range of Bannockburn vineyards, with the majority of grapes coming from earlier plantings which are predominantly clones 5, 6 and 10/5. More recent plantings are a mix of Dijon clones: 113, 115, 667 & 777. Harvesting began on the 23rd March and continued through to the 27th April. ]The majority of the ferments were de-stemmed only; the remaining third contained 16-30% whole clusters. The must underwent 9-10 days of cold maceration during which time it was hand plunged once daily. The ferments were heated after this and all fermented with indigenous yeasts. The ferments lasted for an average of 10-12 days during which time they were hand plunged twice daily with the temperature peaking at 33oC. The wine stayed on skins for a further 6-8 days post-dryness, and was plunged once daily with increasing ease. When the wine tasted in harmony it was pressed off to barrel where it resided on full lees for 12 months. It underwent malolactic fermentation in the spring, was racked out of barrel in late autumn and filtered prior to bottling. Dark, deep ruby-red colour in the glass. Not an intense bouquet compared with say the Felton Road Pinot Noir from the same area but dominated by berry fruit. The palate is juicy with plummy with red cherry and raspebrry with plenty of fruit notes as a result of the warmth of the vintage. Aciditiy is the dominant feature right now, but somewhat balanced by fine grained tannins. Nice but not spectacular in 2013....perhaps in a couple of years.